Ductifera pululahuana (now there's a mouthful) is fairly widely distributed, at least in eastern and southern North America, and its range extends well into South America. 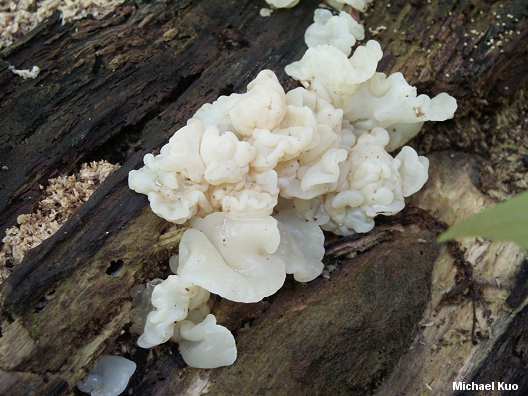 It fruits on the decayed wood of hardwoods, and is apparently one of the later fungal species that line up to decompose dead wood when a trees falls, since it typically appears on well rotted logs after the bark has disappeared. Exidia alba is a synonym. Tremella fuciformis is similar but less glob-ish and (slightly) more graceful; it lacks gloeocystidia. 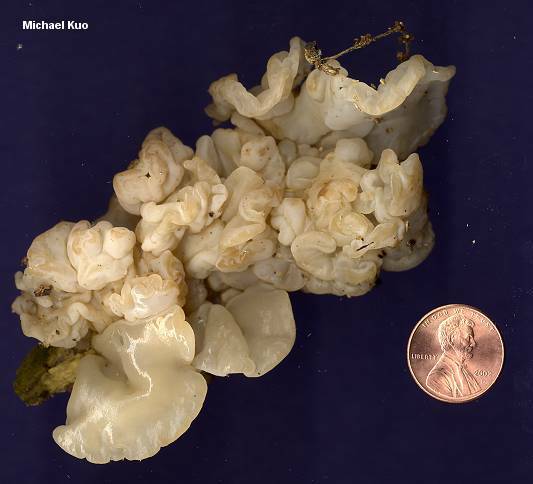 Tremella reticulata grows on the ground and has a nearly coral-shaped fruiting body. The tongue-twisting species epithet of Ductifera pululahuana results from the fact that Patouillard originally collected the type specimen in Pululahua, Ecuador. Ecology: Probably saprobic on decaying hardwood logs (typically after the bark has disappeared); late spring, summer, and fall (probably to be expected in winter in tropical and subtropical areas); distribution uncertain but documented in eastern and southern North America, and as far south as Ecuador. Fruiting Body: A mass of individual whitish, jelly-like globs growing in close proximity and often fusing together to form structures reminiscent of exposed brains; individual globs up to about 3 cm across, irregularly shaped but frequently roughly fan-shaped; stemless; flesh thick and gelatinous. Older specimens may discolor somewhat yellowish, brownish, or even pinkish to purplish. Microscopic Features: Spores 9-12 x 4.5-7 µ; sausage shaped or broadly elliptical. Basidia longitudinally septate, with sterigmata to 75 µ long. 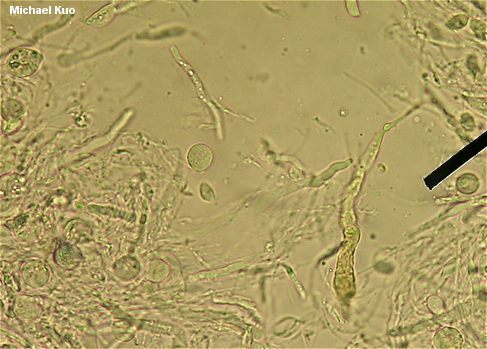 Gloeocystidia present; often 80 µ long or longer. REFERENCES: (Patouillard, 1893) Donk. (Wells, 1958; Lowy, 1971; Barron, 1999; McNeil, 2006.) Herb. Kuo 06130201, 06070303.